Street skating is the best fun but adding a pumping soundtrack takes the experience to another level. LondonSkate takes its sound system very seriously and the atmosphere it creates on the streets is unbelievable. The Bassfreight™ is the sound of LondonSkate. 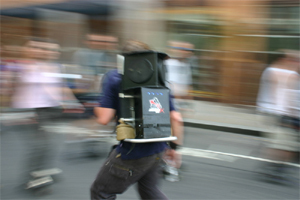 Mounted on a specially built bicycle and powered by a massive custom battery pack the Bassfreight™ brings music to the streets. Accompanied by the ASBOX™ radio linked repeaters, carried by skaters the system delivers an incredible amount of sound. Playing specially crafted mixes of tunes old and new the Bassfreight™ and ASBOX™’s help create that famous LondonSkate party vibe. Funded by personal donations, money raised on the LondonSantaSkate and other events the system, now in its third incarnation is run and maintained by the LondonSkate Sound Crew. Too fat to fit all the details here the Bassfreight™ has its own website. Rolling with an ASBOX™ is much easier than you would think. Designed to be lightweight and comfortable there is the added advantage of always being with the music! If you are interested in joining the ranks of ASBOX™ pilots then get in touch.